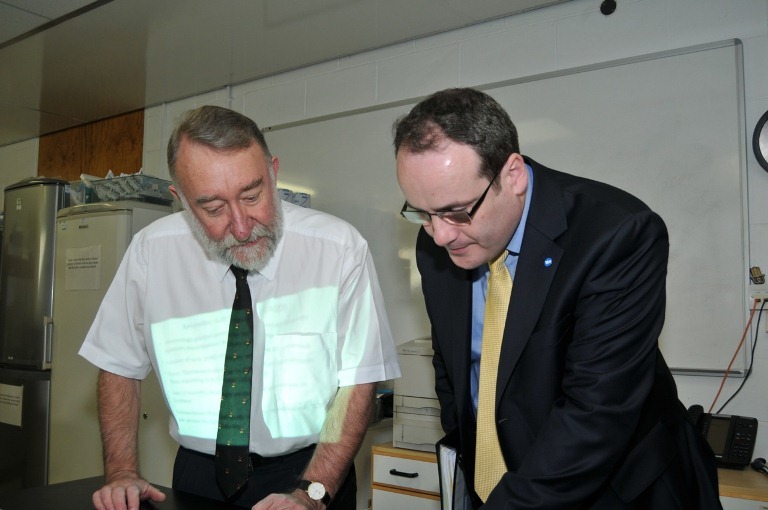 Minister for Environment and Climate Change, Paul Wheelhouse, praised the work of staff and students during a recent tour of the University of Stirling’s world-class Institute of Aquaculture. The SNP MSP for South Scotland was given a hands-on tour of the facilities by the Institute’s Director, Professor Brian Austin, to learn more about the Institute’s research, which has an impact on communities across the globe. This included a visit to various laboratories and the tropical aquarium and involved talks on parasitology, sea lice control, sustainable aquaculture and nutrition. The Minister also had his Omega 3 levels measured at Stirling’s special testing facility. The Aquaculture tour enabled Mr Wheelhouse to find out about a variety of world-leading projects being carried out at Stirling. These include the creation of a diagnostic tool to assist in the diagnosis of fish diseases and the SEAT project - which explores the sustainability of the trade in aquaculture products from Bangladesh, China, Thailand and Vietnam to the European Union. Mr Wheelhouse said: “As a nation, Scotland has been historically renowned for delivering high quality education and pioneering science, fostered by a spirit of innovation. Visiting the Institute of Aquaculture at the University of Stirling, I was pleased to find that all three of these qualities are well evident. The Institute of Aquaculture is the leading international centre in its field and is the largest of its kind in the world. It works with people, organisations and governments all over the globe - to carry out research into strategies for sustainable aquaculture, whether in modern commercial markets or in developing countries.